« Friday Favorite: PhillySwirl Sweet Delites Frozen Treats… Only 14 Calories! It seems that everywhere I turn, folks that are on a gluten-free diet, are also are on a dairy-free diet too. Talk about a double-whammy. Statistics now support the connection between dairy- and gluten-related health issues, and more and more people are being diagnosed with BOTH gluten and dairy issues. And Denise Jardine is one of those people. Denise, a nutritional educator who wrote “Recipes for Dairy-Free Living”, found out that she too also had gluten-related issues, after eighteen years of living with a dairy allergy. So back to the kitchen and keyboard went Jardine. And this time she’s cooked up a gem of a cookbook for those on a gluten-free and dairy-free diet: “The Dairy-Free & Gluten-Free Kitchen… 150 delicious dishes for every meal, every day”. This cookbook is full of easily approachable recipes that are straightforward to read and prepare; however, the recipes themselves yield those “you-shouldn’t-have-slaved-in-the-kitchen-all-day-for-me” comments from your family, friends and guests. Some of the recipes that caught my eye, and put a grumble in my stomach include Coconut-Lime Seafood Stew, Peppered Pork Tenderloin in Mustard Cream Sauce and German Apple Souffle a la Mode. Dinner party anyone? And if you have other allergies or watching your sugar intake, no worries, Jardine has you covered. Similar to BeFreeForMe.com recipes, the recipes in this cookbook has a coding system that indicates other common allergens the recipe is free of. What a perfect cookbook for BeFreeForMe.com readers! Which is why I was thrilled that this Win-It-Wednesday on BeFreeForMe was going to be sponsored by The Dairy-Free & Gluten-Free Kitchen Cookbook. 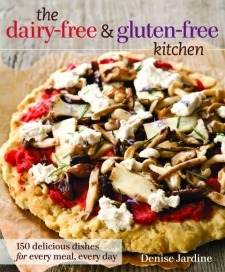 A total of two BeFreeForMe members will be selected to win a copy of this cookbook. One (1) winners will be randomly selected from the entries received before Tuesday, March 13, 2012 at 11:59 PM EST, and one (1) more winners will be randomly selected to win from the entries received between Wednesday, March 14 and Tuesday, March 20, 2012 at 11:59PM. SO – make sure you enter two times to win! This entry was posted on Tuesday, March 6th, 2012 at 8:36 pm	and is filed under Win-It-Wednesday. You can follow any responses to this entry through the RSS 2.0 feed. You can leave a response, or trackback from your own site. Free to me means no borders, no limits. A day with nothing on my calendar! As a family with multiple allergies, I love it when we are free to eat without worry. Free to cook or order from a restaurant without fear of repercussions. Free to enjoy foods that have previously caused pain. Free to be me. being free to be a child-I am director of junior church at a small church & part of my duties are to provide a healthy sunday morning snack.There are different children with different food allergies-gluten,dairy,nuts,chemicals,etc.I want each and every child to feel part of the group-having a resource to be able to choose food items that all the children can enjoy together &be free to choose for themselves would sure make a great morning! Free is being able to enjoy a meal ANYWHERE without worrying what it is made of. Being free to me is that I can find things I can eat and enjoy , and all so surviving cancer. I feel being free is having winter almost over and starting to enjoy the warmth of the sun again…to see new growth in the gardens..to hear the birds return..to know that I too play a part in this world and trying to enjoy the little things and appreciate life more! Good question, having kids means getting that rare free moment to myself on my day to sleep in! Free to me means freedom from stress and worry, sickness and infirmities, lack and poverty, and being about to enjoy life, liberty, and the pursuit of happiness. I feel free when I am out in nature; especially while in the mountains looking out over a valley or a lake. It’s so beautiful and calm. For me being free is being happy and in control of my life. Being free would be knowing that our food isn’t loaded with unnatural chemicals, hormones, etc. Those that the FDA/industry has deemed necessary for “quality”. Would love to just go back to a more natural state where we don’t kill off the nutrition by overcooking and then add back man made nutritional quality. God got it right the first time! I feel free when I can be completely at peace and in the moment; those rare times when the I am not thinking about that infinite to-do list that I keep in my brain. Free to me means the ability to drop everything and take advantage of an opportunity…a beautiful day, time with friends and family, or just a day to do as I please. Free means the ablity to follow whatever dream I may dream, think whatever thoughts I may think and say whatever words I may say without fear of judgement. Being free is when I realize that I have the capacity to make a huge difference in my own life and the lives of others. Free to me is free to eat without worry! Being Free to me me is having the opportunity to achieve my goals and dreams and live my believs without government interference.. Being Free means to be at peace within yourself and others. Free to me means the ability to sacrifice my needs for the needs of others. Free, in this case, means to me being healthy and making best choices so my body is fueled by the best selections of fuel for it to perform at its best. Free means unencumbered, not burdened, not held back. Free to me is living my best life, making my choices, reaching for my stars…respecting myself while respecting others. Free means open to the possibilities. I think I limit myself too much of the time with ‘shoulds’ and ‘would’s and ‘coulds’ and ‘have to’s’ and other limitations. I’m working on staying more open and trusting that the answer that comes will be right and true and the best possible option without pre loading my mind with a bunch of parameters. Free means a day to myself where I can sit around in my pjs and nobody yelling my name! being free to me is sleeping in and not fretting about my ever growing to do list…. Free to me not having to worry about anything in life! The freedom felt when joining in with the laughter, the whole-hearted belly laughter that comes so freely to a baby. They feel no restrictions, no shyness, no worries. They just do it! For me being free is not sweating the small things. Being free is getting rid of my worries and taking the time to enjoy all that life has to offer! Free is….no worries, anxieties, second thoughts….just carefree. Being free is being able to enjoy the outdoors on a beautiful day . Hear the birds singing and children playing. Watching the deer run around. And seeing flowers grow. To me being free is how I feel now that my tumor is gone and I don’t have to deal with Cushings symptoms anymore. You’ve made me think on this with your question. Freedom seems to change meaning by the day and what is going on in my life to some degree. Today I am free from errands but have more work to do. Meaning, I am unencumbered from the running around town and waiting in lines and dropping off and picking up of life, but I am more tied to my desk at work. It still feels freeing. I like my work and the weather outside is just nasty! I was diagnosed in 2007 with CD. Now I have first hand experience of what it means to be free and I know that being free is very doable. It just takes patience and perseverance. The wind in my hair with a smile on my face!!!!!!!!! To be free to me means living without the fear of what might be. To be free live life happily. Free means free from stress. The art of being free. It’s very hard in these job/errand/chore filled days. I have found that riding my bike and actually feeling the wind, the muscles pushing and straining, and taking great care to actually see scenery that surrounds me…it makes me slow down and be a part of this world rather than hurrying through it. free means a day all to myself! Get in the car and drive. Wherever you end up is where you were supposed to go. Free means having a choice. To Be Free, would mean not worrying about what you pick up and touch each and every day. Not carrying a tooth brush & mouth wash so you can rinse your mouth every time you head for home, because your child has a severe peanut allergy. Being free would allow a little boy to attend a live baseball game, to do the seventh inning stretch. To be free would mean that we could pick-up a snack anywhere, anytime, with anyone and not inconvenience them or their choices. To be free of a food allergy would make life easier, but I am free. Then I realize – we are free of the mundane flour that everyone else uses. Our flavor palate has been expanded we get to use sorghum, millet, tapioca, almond meal, garfava beans, quinoa, and so many others. Not to mention the wonderful greens that we now enjoy… These food allergies have freed us from the normal SAD American Diet and have allowed us the opportunity to experience more than most people will be able to. We are free, in a way. Being free means being at peace with oneself.